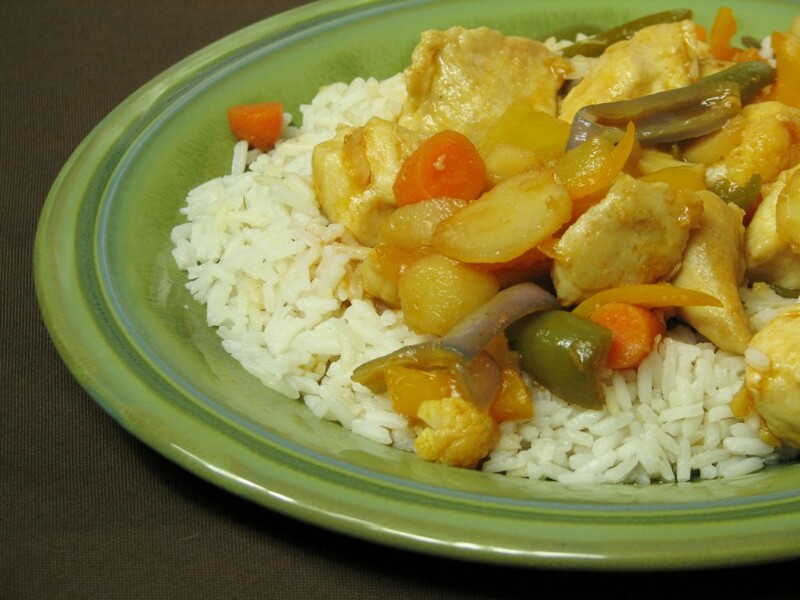 For all my childhood, I grew up enjoying the smell of mom’s sweet and sour chicken floating throughout the house. It was a fairly standard fare at the time without much experimentation, but when the meal was over, there were never any complaints or leftovers. During leaner times, we might use the dark meat cuts of chicken and more peppers and rice, but we hardly noticed at all. It was heaven on earth as far as I was concerned and my dad, siblings and I always wanted it more often than she could fix it. Now it’s 2012, a long time since I left home, and my children get to enjoy that same lovely aroma. As it was cooking tonight, I could see little heads popping around the corner asking when supper was going to be ready. I tend to experiment with a broader range of ingredients a bit more than mom did, but one mouthful into this plate brought many wonderful memories of childhood. Our household has acquired a taste for a wide range of vegetables, so including them into a dish such as this is seldom ever even noticed. No one even guessed that jalapeno peppers were in it, but it was something new for me to include in the dish. It was a perfect match for us. After serving it tonight, there were smiles and compliments all around, but no leftovers. In a bowl, combine the chicken cubes with the egg white, 1/4 tsp salt and cornstarch. Stir to coat all pieces evenly and allow to sit at room temperature for 15-20 minutes or up to overnight in the refrigerator. Heat a wok or large frying pan over high heat until a drop of water immediately sizzles and starts to evaporate. Put in one tablespoon of oil, allowing it to heat and swirl it in the pan to coat it. The pan must be very hot, so don’t let the oil smoke before you start adding ingredients. Add in the chicken and spread it out in a single layer. Let the chicken cook untouched for a full minute or until the bottoms start to brown. Flip the chicken over and allow the other side to brown for a full minute. The chicken will still be pink in the center and that is ok. Remove the chicken to a bowl or plate, leaving as much oil in the pan as you can. Add the remaining oil and swirl it around in the pan. Once the oil is heated thoroughly, add in the cauliflower and carrots. Fry for 2 minutes, stirring occasionally. Add in the pepper chunks, water chestnuts, and ginger and fry for 1-2 minutes, stirring constantly. Add in the pineapple chunks and the sweet and sour sauce. When the sauce starts bubbling, add the chicken back in. Let everything simmer until the chicken cooks through. This may take 2-4 minutes depending on the size of the chicken pieces. After 2 minutes, cut one of the larger pieces in half and look to see if there is any pink showing. If so, let it go another minute or two. Taste the sauce and add more rapadura if it needs to be mellowed a bit. Serve over rice, if desired and generously apply the sauce when served. For a little extra ginger kick, add powdered ginger in with the rice when it starts cooking.